M.Sc. in Rural Technology (4 Sems.):B.Sc. with Botany/Zoology/Geology/Rural Technology/Agriculture/ 4 Year B.Sc. Forestry/Horticulture with 45% marks for GEN/OBC/EWS and 40% for SC/ST category. MA Home Science [4 years]: Graduation and Home science as a subject in Graduation with 40% for GEN/OBC/EWS and for SC/ST as per University rules. M.Sc Remote Sensing and GIS Application [4 Sems]: B.Sc. with Botany, Zoology, Forestry, Agriculture, Physics, Geology, or Geography with Min. 55% for GEN/OBC/EWS and 50% for SC/ST Candidates or B.Tech. in the relevant discipline with at least 50% marks or equivalent score. Knowledge of computers is must. MA Education [4 Sems]: Graduation in any discipline with 40% for GEN/OBC/EWS and for SC/ST as per University rules. M.Ed [4 Sems]: s B.Ed. as per NCTE rules. MA Naturopathy and Yoga [4 sems]: Graduation in any discipline with 40% for GEN/OBC/EWS and for SC/ST as per University rules. PG Diploma in Yogic Science [2 sems]: Graduation in any discipline with 40% for GEN/OBC/EWS and SC/ST as per University rules. MA in English (4 Sems):Graduation with 40% for GEN/OBC/EWS and English as a subject and 35% for SC/ST category. M.Sc. Zoology [4 Semesters]: B. Sc. (Zoology) with 45% for GEN/OBC/EWS and forSC/ST as per University rules. 5- years Integrated M.Sc.Biotechnology [10 Sems]: 10+2 Science (CBSE, ICSE or any equivalent board) with 60% for GEN/OBC/EWS and 55% for SC/ST category. M. Sc. Himalayan Aquatic Biodiversity [4 Semesters]: B. Sc. (Life Sciences) with 45% for GEN/OBC/EWS and for SC/ST as per University rules. M. Sc. Botany [4 Sems]: B. Sc. (Botany) with 45% for GEN/OBC/EWS and for SC/ST as per University rules. M. Sc. Microbiology [4 Sems]: B. Sc. (any stream of life sciences) with 45% for GEN/OBC/EWS and for SC/ST as per University rules. M.Sc. Biochemistry [4 Sems]: B.Sc. Biology with Chemistry or Biochemistry as one of the subjects studied for 3 years with 45% marks for GEN/OBC/EWS and for SC/ST as per University rules. M. Sc. Environmental Science [4 Sems]: B. Sc. (any stream of Science) with 45% marks for GEN/OBC/EWS and for SC/ST as per University rules. Advanced PG Diploma in Environmental Economics [2 Sems]: M. Sc. (any stream of Science)/M.Tech. /M. Sc. Ag. with 55% marks for general and for SC/ST as per University rules. P.G. Diploma in Environmental Management [2 Sems] M. Sc. (any stream of Science)/M.Tech. /M. Sc. Ag. with 55% marks for GEN/OBC/EWS and for SC/ST as per University rules. MA (Economics, History, Archaeology, Philosophy, Political Science, Psychology, Sociology, MSW [4 sems]: Graduation in any discipline with 40% marks for GEN/OBC/EWS and for SC/ST as per University rules. M.B.A. [4 Sems]: Graduation in any Discipline and valid CAT/MAT/CMAT Score 2019. M.B.A. (Tourism and Travel Management) [4 Sems]: Graduation in any Discipline and valid CAT/MAT/CMAT Score 2019. B.Tech. (CSE, ECE, EIE, ME, IT) [8 Semesters]: Passed 10+2 examination with Physics and Mathematics as compulsory subjects along with one of the subjects-Chemistry / Biotechnology / Biology Obtained at least 45% marks (40% in case of candidate belonging to reserved category) in the above subjects taken together with valid JEE Main 2019. Admission to MBA (Business Management) and MBA (Tourism and Travel Management) shall be based on valid CAT/MAT/MAT Score-2019. A candidate can appear in Entrance Test for PG Program maximum in three subjects. Candidates applying for more than one PG programs need to apply separately in application form along with the prescribed fee. Each question shall be of 01 mark and there shall be no negative marking. The students shall be allowed a maximum of two hours time to complete the test. Candidates can apply online by visiting University website https://hnbgu.ac.in/ by paying prescribed fee through bank challan. Detailed instructions to fill the application is available on the official website. 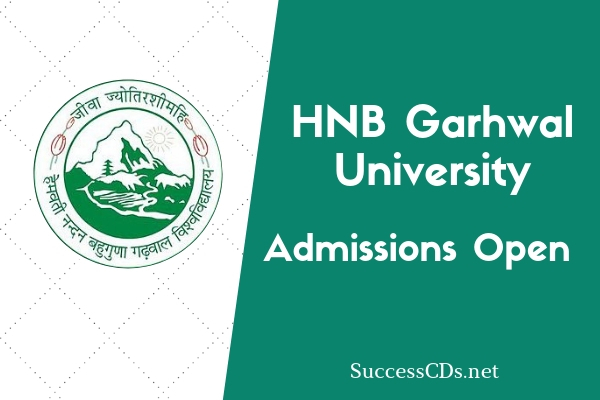 Information brochure, eligibility, procedure, further updates etc., will be available at https://hnbgu.ac.in/ from 16th April 2019 onwards.